show interfaces - Displays statistics for all interfaces on the device. 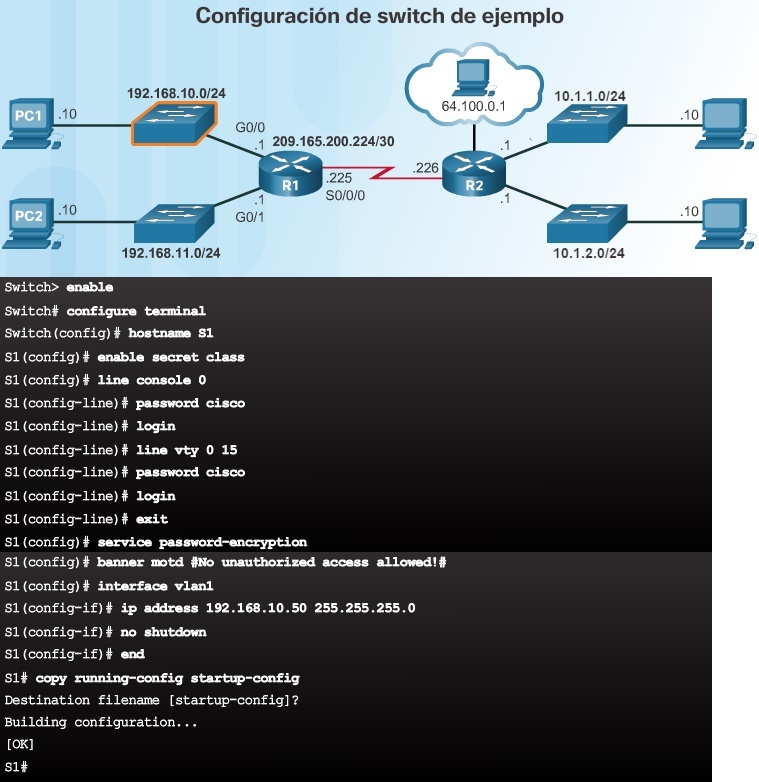 show ip route - Displays the contents of the IPv4 routing table stored in RAM. The show ip interface brief command output displays all interfaces, their IPv4 address, and their current status. The configured and connected interfaces should display a Status of “up” and Protocol of “up”. Anything else would indicate a problem with either the configuration or the cabling. Layer 2 switch does not require an IP address to function properly. However, if you wish to connect to the switch and administratively manage it over multiple networks, you will need to configure the SVI with an IPv4 address, subnet mask, and default gateway address. To configure a default gateway on a switch, use the SW(config)#ip default-gateway global configuration command. Router Bootup Process The show version command displays information about the version of the Cisco IOS software currently running on the router, the version of the bootstrap program, and information about the hardware configuration, including the amount of system memory. 3. Locate and load the startup configuration file or enter setup mode. The bootstrap program then copies the startup configuration file from NVRAM into RAM. This becomes the running configuration. If the startup configuration file does not exist in NVRAM, the router may be configured to search for a TFTP server. If a TFTP server is not found, then the router displays the setup mode prompt. 2. Locate and load the Cisco IOS software. The IOS is typically stored in flash memory and is copied into RAM for execution by the CPU. If the IOS image is not located in flash, then the router may look for it using a Trivial File Transfer Protocol (TFTP) server. If a full IOS image cannot be located, a limited IOS is copied into RAM, which can be used to diagnose problems and transfer a full IOS into Flash memory. During the Power-On Self-Test (POST), the router executes diagnostics from ROM on several hardware components, including the CPU, RAM, and NVRAM. After the POST, the bootstrap program is copied from ROM into RAM. 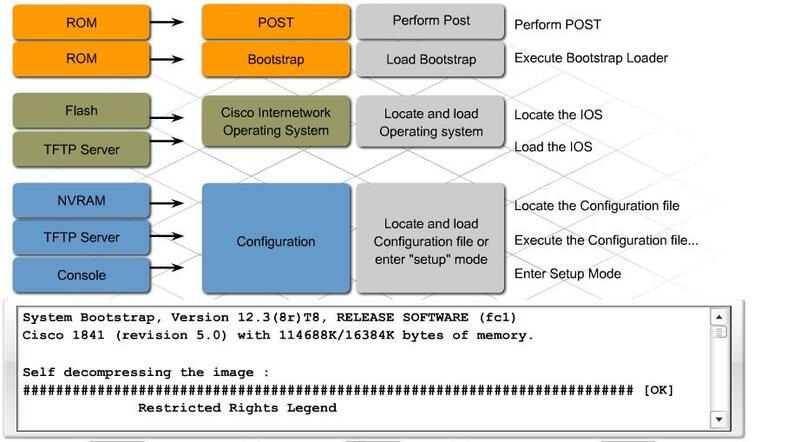 The main task of the bootstrap program is to locate the Cisco IOS and load it into RAM. At this point, if you have a console connection to the router, you begin to see the output on the screen. A router has access to volatile or non-volatile memory storage. Volatile memory requires continual power to maintain its information. When the router is powered down or restarted, the content is erased and lost. Non-volatile memory retains its information even when a device is rebooted. Flash - This non-volatile computer memory used as permanent storage for the IOS and other system related files such as log files, voice configuration files, HTML files, backup configurations, and more. When a router is rebooted, the IOS is copied from flash into RAM. NVRAM – This is non-volatile memory is used as the permanent storage for the startup configuration file (startup-config). ROM - This non-volatile memory is used to store crucial operational instructions and a limited IOS. Specifically, ROM is firmware embedded on an integrated circuit inside the router which can only be altered by Cisco. Click ROM in the figure to view more information. Service Provider - Large service providers. Includes Cisco ASR, Cisco CRS-3 Carrier Routing System, and 7600 Series routers. WAN - Large businesses, organizations, and enterprises. Includes the Cisco Catalyst Series Switches and the Cisco Aggregation Services Routers (ASR). Branch - Teleworkers, small businesses, and medium-size branch sites. Includes Cisco Integrated Services Routers (ISR) G2 (2nd generation). • Which interface to use to reach the requested destination. L - Identifies that this is a local interface. This is the IPv4 address of the interface on the router. C - Identifies a directly-connected network. Directly-connected networks are automatically created when an interface is configured with an IP address and activated. A host's routing table will typically include a default gateway. If the destination host is on a remote network, the packet is forwarded to the default gateway. When a packet arrives at the default gateway, the router looks at its routing table to determine where to forward packets. Default route – Like a host, routers also use a default route as a last resort if there is no other route to the desired network in the routing table. Remote routes - These routes come from remote networks connected to other routers. Routes to these networks can be manually configured on the local router by the network administrator or dynamically configured by enabling the local router to exchange routing information with other routers using a dynamic routing protocol. Directly-connected routes - These routes come from the active router interfaces. Routers add a directly connected route when an interface is configured with an IP address and is activated. Each of the router's interfaces is connected to a different network segment. On a Windows host, the route print or netstat -r command can be used to display the host routing table. Both commands generate the same output. IPv4 Route Table - Lists all known IPv4 routes, including direct connections, local network, and local default routes. IPv6 Route Table - Lists all known IPv6 routes, including direct connections, local network, and local default routes. Remote host - This is a host on a remote network. The hosts do not share the same network address. Routing is the process of identifying the best path to a destination. The router connected to the local network segment is referred to as the default gateway. The default gateway is the network device that can route traffic to other networks. Local host - This is a host on the same local network as the sending host. The hosts share the same network address. Itself: A host can ping itself by sending a packet to a special IPv4 address of 127.0.0.1, which is referred to as the loopback interface. Pinging the loopback interface tests the TCP/IP protocol stack on the host. Unlike IPv4, routers do not fragment routed IPv6 packets. An IPv6 packet may also contain extension headers (EH), which provide optional network layer information. Extension headers are optional and are placed between the IPv6 header and the payload. EHs are used for fragmentation, security, to support mobility and more. Destination IPv6 Address - This 128-bit field identifies the IPv6 address of the receiving host. Source IPv6 Address - This 128-bit field identifies the IPv6 address of the sending host. Hop Limit - This 8-bit field replaces the IPv4 TTL field. This value is decremented by a value of 1 by each router that forwards the packet. When the counter reaches 0, the packet is discarded, and an ICMPv6 Time Exceeded message is forwarded to the sending host, indicating that the packet did not reach its destination because the hop limit was exceeded. Next Header - This 8-bit field is equivalent to the IPv4 Protocol field. It indicates the data payload type that the packet is carrying, enabling the network layer to pass the data to the appropriate upper-layer protocol. Payload Length - This 16-bit field indicates the length of the data portion or payload of the IPv6 packet. Flow Label - This 20-bit field suggests that all packets with the same flow label receive the same type of handling by routers. 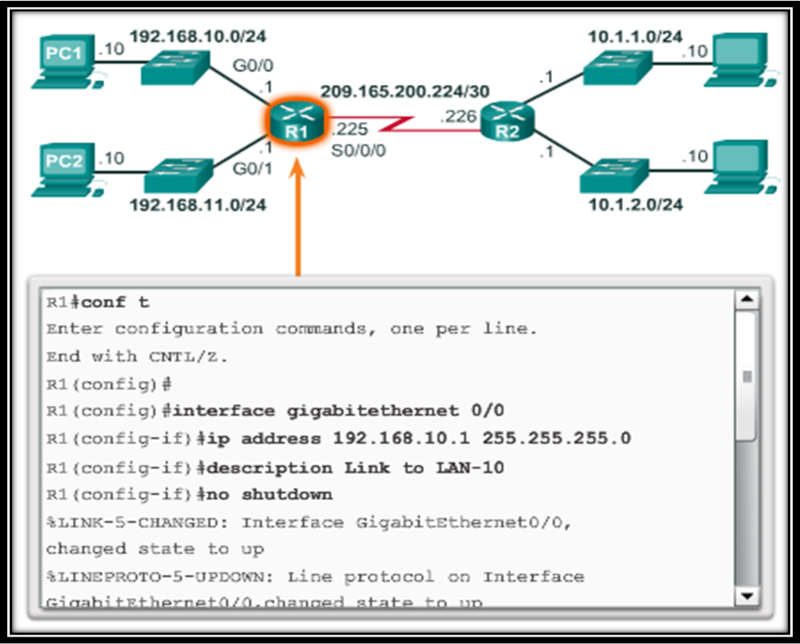 Traffic Class - This 8-bit field is equivalent to the IPv4 Differentiated Services (DS) field. Version - This field contains a 4-bit binary value set to 0110 that identifies this as an IP version 6 packet. Eliminates the need for NAT - With such a large number of public IPv6 addresses, NAT between a private IPv4 address and a public IPv4 is not needed. This avoids some of the NAT-induced application problems experienced by applications requiring end-to-end connectivity. Increased address space - IPv6 addresses are based on 128-bit hierarchical addressing as opposed to IPv4 with 32 bits. Improved packet handling - The IPv6 header has been simplified with fewer fields. Lack of end-to-end connectivity - Network Address Translation (NAT) is a technology commonly implemented within IPv4 networks. NAT provides a way for multiple devices to share a single public IPv4 address. However, because the public IPv4 address is shared, the IPv4 address of an internal network host is hidden. This can be problematic for technologies that require end-to-end connectivity. Destination IPv4 Address - Contains a 32-bit binary value that represents the destination IPv4 address of the packet. The destination IPv4 address is a unicast, multicast, or broadcast address. Source IPv4 Address - Contains a 32-bit binary value that represents the source IPv4 address of the packet. The source IPv4 address is always a unicast address. Protocol - Field is used to identify the next level protocol. This 8-bit binary value indicates the data payload type that the packet is carrying, which enables the network layer to pass the data to the appropriate upper-layer protocol. Common values include ICMP (1), TCP (6), and UDP (17). Differentiated Services or DiffServ (DS) - Formerly called the Type of Service (ToS) field, the DS field is an 8-bit field used to determine the priority of each packet. The six most significant bits of the DiffServ field is the Differentiated Services Code Point (DSCP) and the last two bits are the Explicit Congestion Notification (ECN) bits. Version - Contains a 4-bit binary value set to 0100 that identifies this as an IP version 4 packet. The protocol was not designed to track and manage the flow of packets. These functions, if required, are performed by other protocols at other layers, primarily TCP at Layer 4. Media independent: Operation is independent of the medium carrying the data. However, one major characteristic of the media that the network layer considers: the maximum size of the PDU that each medium can transport. In some cases, an intermediate device, usually a router, must split up a packet when forwarding it from one medium to another medium with a smaller MTU. This process is called fragmenting the packet or fragmentation. The data link layer passes the MTU value up to the network layer. The network layer then determines how large packets can be. Best Effort: IP is inherently unreliable because packet delivery is not guaranteed. Connectionless: No connection with the destination is established before sending data packets. Layer 3 provides services to allow end devices to exchange data across the network. Unlike the transport layer, which manages the data transport between the processes running on each host, network layer protocols specify the packet structure and processing used to carry the data from one host to another host. Operating without regard to the data carried in each packet allows the network layer to carry packets for multiple types of communications between multiple hosts. De-encapsulation - When the packet arrives at the network layer of the destination host, the host checks the IP header of the packet. If the destination IP address within the header matches its own IP address, the IP header is removed from the packet. After the packet is de-encapsulated by the network layer, the resulting Layer 4 PDU is passed up to the appropriate service at the transport layer. Routing - The network layer provides services to direct packets to a destination host on another network. To travel to other networks, the packet must be processed by a router. The role of the router is to select the best path and direct packets toward the destination host in a process known as routing. A packet may cross many intermediary devices before reaching the destination host. Each router a packet crosses to reach the destination host is called a hop. Encapsulation - The network layer encapsulates the protocol data unit from the transport layer into a packet. The encapsulation process adds IP header information, such as the IP address of the source (sending) and destination (receiving) hosts. Addressing end devices - End devices must be configured with a unique IP address for identification on the network.